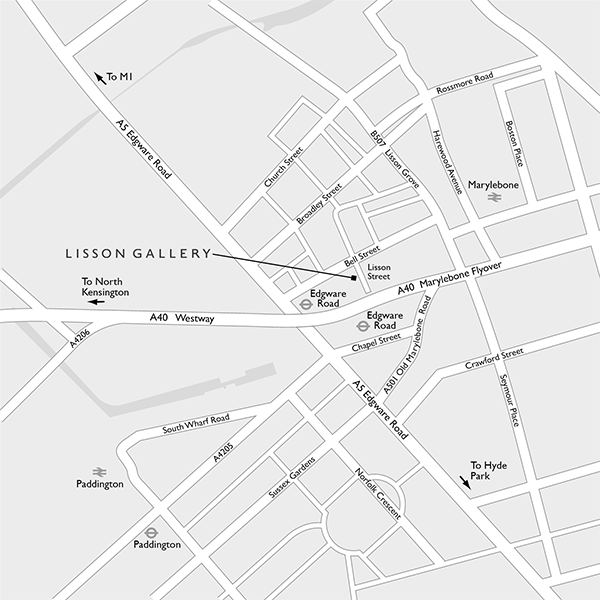 Lisson Gallery is pleased to announce an exhibition of new work by Jason Martin. Following exhibitions in New York and Paris last year, Jason Martin continues his investigation into the fundamentals of oil painting, creating horizontally banded compositions of multiple shades, chromatic blends and subtle tonal shifts. This exhibition will be constructed around a trio of different colours divided across three rooms, working from variations on titanium white, Cobalt blue and a suite of works made using a new material for the artist: graphite. As seen throughout his career, Martin never ceases to challenge himself and interrogate the origins and parameters of painting. Through his experiments into the unknown, Martin explores new materials to discover different reactions through which to expand his practice. For this exhibition Martin utilises graphite, known for many purposes, from lead pencils to batteries, and yet not known for its use in painting. Working with the paint manufacturer Old Holland – a company started by Dutch Old Master painters in the 17th century that has for centuries produced paint for artists, from Van Gogh to Vermeer – Martin has invented a new type of oil paint. The two unique shades, ‘Jason Graphite Grey’ and ‘Jason Graphite Grey Deep’, blend graphite into the paint mixture directly. The resulting series of works have an intensely textured, metallic-like finish, and due to their earthy and elemental nature, possess a fundamental sculptural quality. Complimenting the dark tones is another room dedicated to Martin’s sharp titanium white paintings. Just as with the dark graphite paintings, these works are made up of multiple shades, from green to blue to pink. Harmonising together to create an indefinable colour, they rhythmically divert the eye with spatial interplay. These works sit within a more traditional understanding of oil painting: viscous and thixotropic, free flowing and malleable to apply, yet fixed and smooth on finish. While Martin’s previous bodies of work assumed a sense of chance and serendipity, this new series of symphonic gradations are more restrained in composition. These paintings are considered and thoughtful, exploring subtle tonal relationships and veering away from the expressionistic gesture or the happenstance of painting. Continuing into the exhibition, visitors will experience Martin’s Cobalt Blue and Cobalt Violet paintings. While Martin’s work naturally aligns in the history of Minimalist painting, each of his paintings reflect a particular subject matter. These works, created using a range of blue hues, depict a landscape scene, traditional in the colouring and composition, yet rendered in a portrait format and with thick impasto oil. Equally, by transforming landscapes into portrait or square formats (and often also by converting colour into grayscale), this new development suggests digital photographic processes. These add to the multiple tensions articulated in these paintings: between nature and manipulation; object and image; and between gestural abstraction and the impulse towards representation. All works presented in the exhibition are consistent in their compositions between three and six divisions, with each band individually created using one broad, focused sweep of the brush. This physical manipulation of the paint is a work of performance in its own right – a representation of the artist’s intense interaction with the space beyond the two-dimensional. The physicality of flooding the surface with the dense layers of paint is at once a personal, solo act and a public presentation – the precise moment is shaped in the layers of folding paint, the deliberate motion immortalised in the final work of art.